Governor Hogan spoke about his 46.6 billion dollar budget which will be presented to legislators Friday. ANNAPOLIS, Md. — Governor Hogan spoke about his 46.6 billion dollar budget which will be presented to legislators Friday. "As a direct result of our fiscal discipline, our belt tightening and business friendly polices over the past four years our state had one of the best economic turn around in the nation," said Governor Hogan. 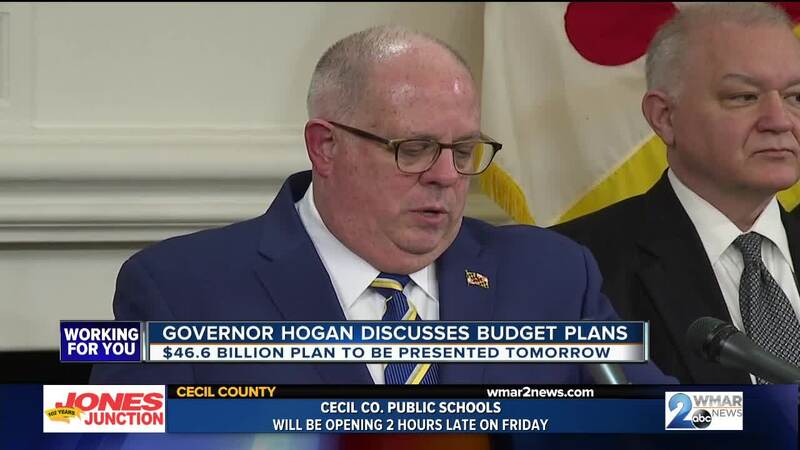 Even though Hogan said the State has 1.3 billion dollars in reserve, Governor Hogan cautioned legislators about unsustainable spending because state revenues can be volatile and unpredictable. "So we must remain vigilant about maintaining savings in order to be prepared for those times when flexibility is needed." Some highlights of the budget are $248 million from the general fund are set aside for the treatment and prevention of opioid addition. Also, the governor said he is earmarking a record amount of money for K through 12 education at 6.9 billion dollars. Governor Hogan also announced he has negotiated a 3% raise with the unions representing state workers. "Unfortunately one union, AFSME, refused to come to the table." Hogan said this was a divisive political game and has filed an unfair labor practices action against the leaders of the AFSME Union. AFSME represents more state workers than any other union. "I do not want to punish hard working state workers because of the failures of the paid political operatives so, our fiscal 2020 budget provides a 3% raise to all state employees including those covered by AFSME." Hogan says he and the legislator may find a way to make sports gambling legal this session instead of waiting for a voter referendum in two years.